Slought Foundation (http://slought.org/) is a non-profit organization based in Philadelphia that engages the public in dialogue about cultural and socio-political change. It collaborates with a range of partners including artists, communities, universities, and governments to encourage cultural inclusiveness and social activism. Culture means more than preservation or presentation; it means the exchange of ideas, the creation of concepts. Philosophers, theologians and scientists have historically maligned curiosity, and the experimental disposition more generally, as a lack of specialization, a sort of intellectual futility or vacuousness. 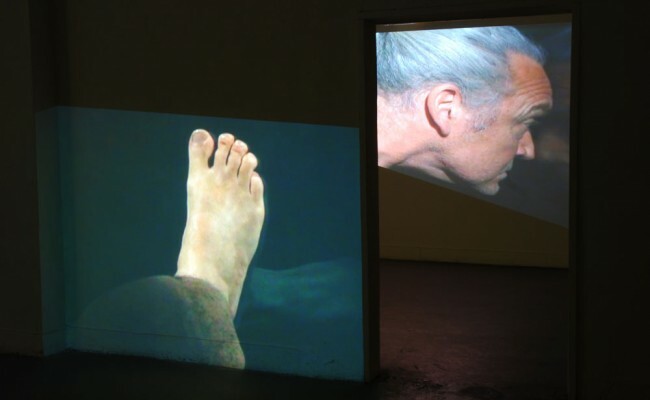 Slought Foundation diverged from this conceptualization, arguing instead for curiosity as a curatorial methodology. Curiosity, for Slought, entails a resistance towards entrenched hierarchies, the fostering of dissent, and the discouragement of habitual forms of thinking. In the spirit of the conceptual information shows of the early 1970s, this exhibition will take the form of an archival exploration into curiosity as the driving force of the Slought Foundation. It will revisit past exhibitions and events with today's pioneers in conversation about contemporary art, architecture, and social theory. 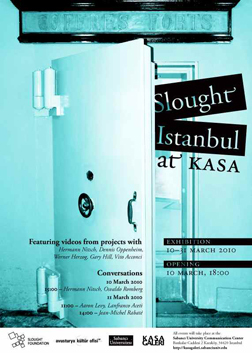 Juxtaposing video documentation of projects with artists such as Hermann Nitsch, Gary Hill, Dennis Oppenheim, Werner Herzog, and Vito Acconci alongside posters and publications, the exhibition hopes in this way to communicate Slought Foundation's signature mix of art, culture, and politics to the public of Istanbul. "Austria, Germany and the Post-war Cultural Milieu"
This presentation will explore the cultural politics of the US Pavilion at the Venice Biennale, which has served as a privileged site for America’s uneven engagement with cultural diplomacy. The focus will be on Into the Open: Positioning Practice, which was the official U.S. pavilion at La Biennale di Venezia at the 11th International Architecture Exhibition, and later traveled to Parsons the New School in New York and the National Constitution Center in Philadelphia. Curator Aaron Levy will speak to the means by which a new generation of architects are reclaiming a role in shaping community and the built environment. The exhibition featured 16 architectural groups who actively engage communities, responding to social and environmental issues, including shifting demographics, changing geo-political boundaries, uneven economic development, and the explosion of urban migration. These intellectually entrepreneurial actors are designing the conditions from which new architectures can emerge-becoming activists, developers, facilitators of inclusive urban policies, as well as innovative urban researchers. Reaching creatively across institutions, agencies, and jurisdictions, they're negotiating hidden resources in the private, public, and non-profit sectors. We know that most politicians lie, hoping that they lie reasonably, as it were, but when they are caught in the act, their careers are ruined. The common root to these phenomena goes back to the paradigmatic figure of the paradox: I am lying but I tell the truth when I say that I am lying. In The Ethics of the Lie, Jean-Michel Rabate will explore this ancient problem in a new light, starting with a contemporary American context. He will address the web of lies that is today spun by the media, but will also turn the microscope on the U.S. presidency and explore the dynamics of family lies. Do we live in an age when disinformation has reached such a fevered pitch that we can dismiss everything presented as "fact" or "news"? In questioning this widespread skepticism, Rabate will deconstruct the pathology of lies and their logical mechanisms, leading us back to the continuing debates of the great philosophers and their philosophical foundations–Plato, Nietzsche, and Aristotle–and in doing so, swears to tell the truth, the whole truth, and nothing but the truth.